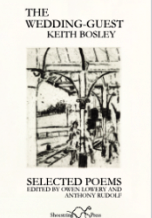 The new collection of Keith Bosley features selected poems from his previous work, published from 1969 to 1997, and new unpublished poems written at various stages of his career, the latest ones dating from 2003. Bosley’s work is remarkable for its expertise in the use of language (in syntax, prosody and at a philological level) without becoming too erudite or pedantic. His numerous translations from Finnish, German, French, Polish, Hebrew and other languages give great breadth to his poems and open to the reader the magical world of words. His work is never abstract and never loses its grip on the ordinary, the everyday flavour of quotidian lives, and our more or less dramatic experiences. He speaks to the reader in a familiar voice telling old and new stories about the war, places he visited, people he met, music, art and how to be casually lost in translation. The title poem, ‘The Wedding Guest’, recalls The Rime of the Ancient Mariner but here it is the guest who tells his harrowing story of surviving in a Nazi concentration camp in Valmiera, Latvia and then being sent to work in Riga and Sachsenhausen. The journeys and the working days are marked by exhaustion, illnesses which spread and kill most of his companions, freezing temperatures and the humiliation of being stripped of possessions and names. The present abuses mix with the memories of the tortures suffered by the Latvian intellectuals after the occupation of the country by the Russian in 1940, and by the bombing of the allies that kill his fellow prisoners and sink one of the ships in which they are transported. The two voices in the poem – the wedding guest and the choir or audience – alternate and thus set up a dramatic conversation that enthrals the reader by matching the choir’s epic rhythm with the wedding guest’s down-to-earth register. His straightforward language reminds me of Primo Levi’s If This is a Man, an objective and clear description of the horrors and deprivations of the Nazis’ rule. Both voices tell their stories with an urgency (‘nothing more must be hidden’) which contains a warning for the future. More joyous and witty, but no less involving, poems are selected from previous collections and also appear in the section of the newly published ones. Humour and understated irony are present in the words of Indian daughters who have adopted western dresses so ‘we can learn/more about each other – / new wisdom, what / Indian legs look like’ (‘The Southall Patriarchs’). All that is left in an old lady’s sparely furnished and pristine house after her death are, books, utensils and an inscription: MY KINGDOM IS NOT OF THIS WORLD, and ‘[y]et the locals say that the old girl owned a / third of the village’ (‘Reversion at Colnbrook’). In ‘The Brush’, a name given to a new pub displaying ‘a fox in scrap/metal’ with ‘a tail / from a dynamo / brush’, the locals cannot manage with the unusual term and the name is changed to COACH AND HORSES. Playing with words and experimenting with new approaches is a characteristic of Bosley’s poetry which recurs alongside more traditional poetic structures. This encompasses both a linguistic aspect and a thematic one. A reflection on language, on the root of words and the tricks of translation is present in various poems. ‘Swan into Swan’ is a metaphoric, yet actual, description of how to teach the word ‘swan’ to a child while feeding a swan near a pond. ‘Words tell / apart, carry the muteness, whiteness / across to the man’, a line that stresses the abstract quality of words and then links ‘swan’ to its French translation, cygne. A pun follows, cygne being connected to signe (sign), which both have the same sound in French. This clever play of words invites the child to translate it, include it in her world of signs. It is a way to widen the perspective, open the mind to other possible views. The poet’s voice itself needs to create this new vision, play and work with words ‘find another man, another swan’. Bosley’s connections with Finland as a prolific translator, an expert in its culture, and husband of the Finnish-born harpist Satu Salo, capture the essence of the country in the merging of mythical symbols and legends with everyday life. In today’s cult of celebrities and in the often trite showing off of the extraordinary, the simplicity of the Kalevala singers, who sing Finnish epic poetry to scholars and visitors, stands out. They sing and sob, and after their performance, which recreates each time their national identity, they go back to their jobs of haberdasher, shop assistant or waitress. The previously unpublished poems are an intimate diary that delineates in accurate details the world contemplated by an accomplished poet who is passionate about words and profoundly aware of the power and limits of language. East London Federation of Suffragettes; Event at Tower Hamlets Local History Library and Archive. I am of Ireland by Seamus Finnegan. Review by Julia Pascal.